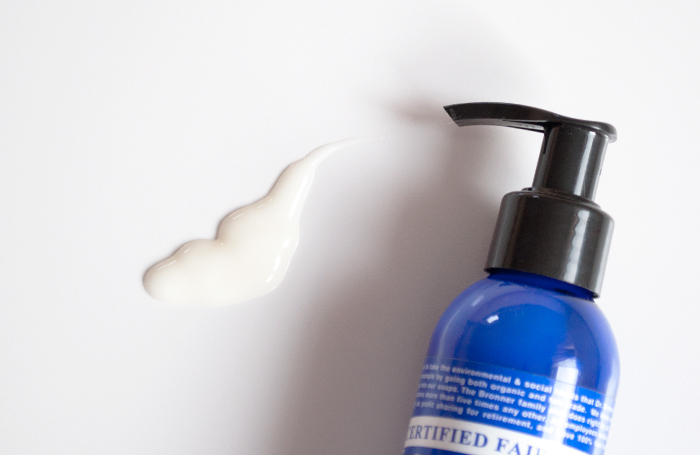 Some of you may have seen my previous post about my first meeting with the fabulous Dr. Bronner’s products (read here if not). Since then, my love has only grown, (and so has my collection of products!) so here’s a bit of a mini review, and some uses for a few products in their range. 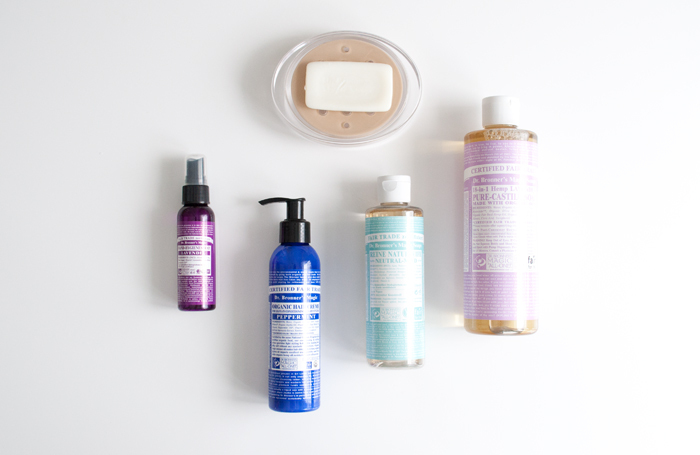 Dr. Bronner’s is a Family Owned and Run natural products company that product eco-friendly, high-quality soaps as well as a variety of other products. Their products are made with organic, biodegradable ingredients and hold a number of certifications including: Leaping Bunny, Fair for Life, Non GMO Project Verified, OTCO (USDA Organic), and Vegan. The soaps can be used for basically anything, but I haven’t made my way very far through the “18-in-1” just yet. 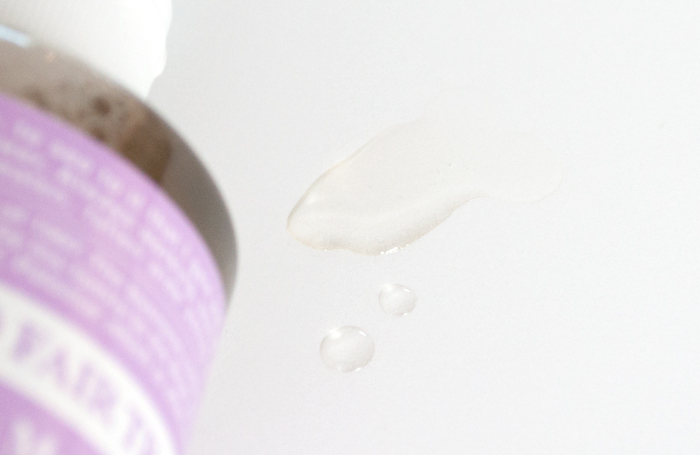 I have recently been using the Lavender Liquid Castile Soap as Shampoo, especially after I’ve done an oil treatment on my hair. The lavender scent is heavenly in the shower (I love lavender though, it’s quite strong) and it does a great job at removing excess oils. Lavender Essential Oil (which gives the soap its scent) is also very good for the scalp with its anti-inflammatory and antiseptic properties. It is also said that its helps to reduce hair loss, as well as keeping hair shiny and soft. I have both the Neutral and Lavender Liquid Castile Soap and I have the say the Lavender seems to be slightly less liquidy? Maybe they were just different temperatures when I was trying to take photos, but the Neutral one was just running everywhere. Both are nearly colourless in small amounts, as can (sort of) be seen in this (very poor) photo. I have used the Liquid Castile Soaps to clean various things including my sink, shower, bath, my face and body, and my makeup brushes. Let me tell you: BEST MAKEUP BRUSH CLEANER EVER! The makeup literally leaps out of the brushes; you have to see it to believe it, its super cool. I can also clean my Beauty Blender dupe from dm with it as well and works surprisingly well. I usually take the Peppermint Bar Soap with me on short trips as it doesn’t take up much space, and I can use it for anything. I quite like using it as shampoo, it lathers well, and smells delicious without being overpowering. My most recent addition is the Peppermint Organic Hair Crème Leave in Conditioner. I was actually trying to get the lavender one, but it had sold out. I’m not overly disappointed though, I love peppermint just as much as lavender, and Dr. Bronner’s have found a way for their peppermint scent not to be super in-your-face. I’m still finding out the best way to use this product as it does have a light hold to it and if you use too much it can really weigh your hair down and make it look greasy. The scent is lovely and subtle and dissipates eventually so you don’t need to worry about smelling like toothpaste. I can use a tiny bit mixed with some water on dry hair to tame the frizz, but this has been a bit hit and miss for me. The best way I have found to use it, is to wash my hair in the evening (I usually do anyway, as I get the best waves without the fuzz) and distribute half a pump through my hair. Next morning, it always looks great! And the effect will last for a couple of days. I certainly have loved using it so far, but will update when I find the best method. 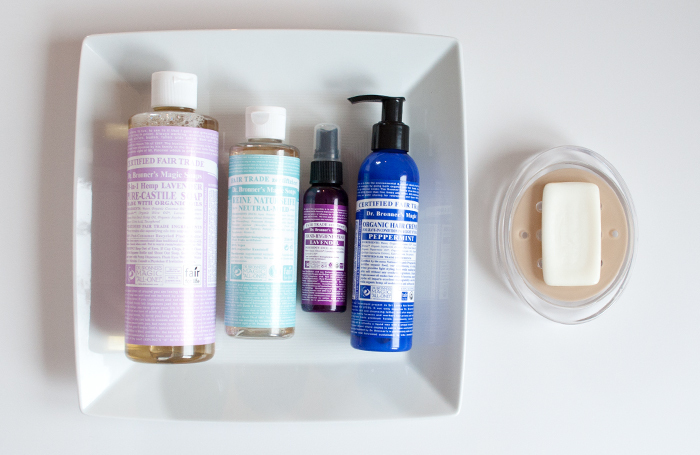 Have you tried any Dr. Bronner’s products or does your Dr. Bronner’s Collection look anything like mine? This is such a great all purpose cleaning product, I love using it in the bathroom and to clean my makeup brushes. It also makes the best window cleaner ever, it doesn’t leave any residue and it only takes seconds to actually clean them! Brilliant stuff!! Great Post!! Love Dr. Bonners stuff. Simple and gets the job done. Although I haven’t tried to use it for everything but I believe that it can come in handy for multipurpose usage. I am also obsessed with Dr. Bronner’s but I had a bad experience using it for laundry. After about 6 months of using it 3-4 times a month in the wash, this white film started to show up. Maybe I was using too much, but whatever went wrong definitely left an impression on my denim jeans and leather accessories (like belts and bags that rub up against my jeans). It’s nothing a wet rag couldn’t fix but I stopped using it after that. Oh no! That doesn’t sound good at all! I haven’t actually tried it as laundry detergent yet (other than small spot cleans) but I know other’s that have, I wonder if they’ve had the same problem…? It does sound like a bit of product build up though. Have you tried washing them in the machine with no detergent or anything? Basically just a good rise with the white film?… Just spitballing ideas here though… No experience in this sorry! Oh no like I said it came out with a good scrub with a wet towel. It was just a word of caution to you and your readers. Great article, though! I still love the product.